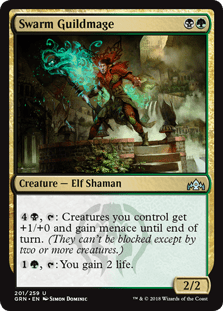 I will be the first to admit out of the gate that my competitive, ladder climbing MTG:A deck is a straight up, gong show, “WTF were you thinking?! ?”mish-mash of play styles and inferior deck building that I am almost afraid to share it. 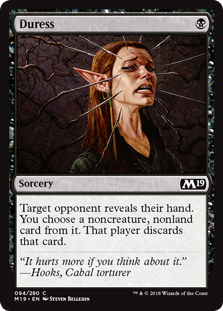 Not because of the ridicule that will most likely be present from Magic The Gathering experts / fans, but because you might actually try to play with it, and pull your own hair out. But here’s the thing. I love it. And it’s SUPER fun. When things line up. Which seems to be more than 50% of the time still, because I am climbing up the ranks and now up in a Gold One ranking. Fun is important too, right? Let me explain why this deck in the first place. I love Green / Black decks. It was the first MTG:A deck I started using and everything about it resonates with me. I typically only play BG decks with each expansion. It’s my jam, so to speak. Now, let me explain how I deck build. There are two parts to that. First, I don’t read up on them, google, find the hot decks. I just play and open packs. 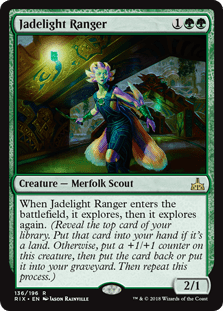 If I see a card I like in the packs I open, I try to think through how it could work in my current deck. Whether it is better than a current card, has synergies, etc. 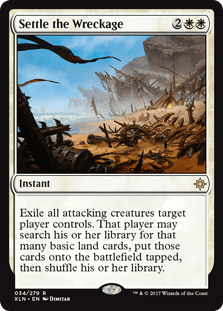 Secondly, during my playing, if I find I card I go against that I love/hate I also wonder if it could have a space in my deck. 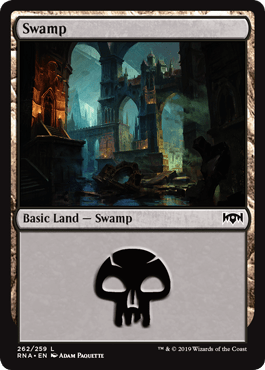 Lastly, I play the MTG:A “one off” mode ranked. Which means it’s a best of one. Most MTG games, from what I can gather, is a best of three – so you have your base deck and a “sideboard” – cards you can add or subtract after your first game. This allows both players to adjust their decks for bad match ups (etc.) Not in the base MTG:A mode. So I built a deck that can compete with anything I have ever seen thrown at me. Jack of all trades. It’s very versatile, a bit unwieldy, but has so many win conditions that every game plays out very differently – which keeps the game fun and fresh for me. 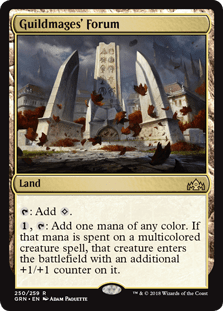 I will break down the deck into Lands, Spells, Creatures, Etc. But it is hard to explain how each card works without sharing what the deck does. 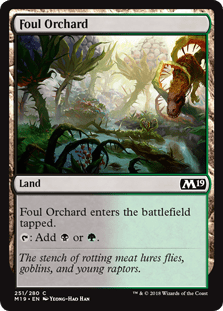 If I were to name it, in the type of way I see Magic Decks named, but very literally, it would be a Golgari Explore Graveyard Removal Pot Pie. 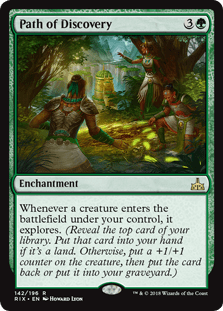 The basis of Explore is when you play a card that ‘Explores’, you get to reveal the top card in your deck. If it is a land card it goes into your hand. If it is anything else the creature card gets +1/+1. The ‘Graveyard’ part is that I have several ways to get my cards out of the Graveyard and back into my hand or onto the field of play. That means that my creature threats are never really gone. 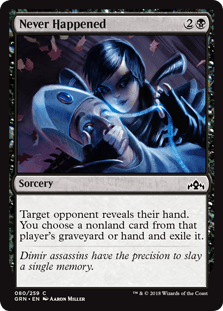 the ‘Removal” part is a significant amount of my deck is to remove opponent cards, neutralizing their threats. The “Pot Pie” part is the side that doesn’t really fit, but really throws opponents for the loop. “Pot” is that I inserted a single type of Blue Card, and the “Pie” is that I inserted a single type of White card. Technically my deck is four colors. Why two separate cards? I will explain those first as it is important. The first I looked for because I needed a way to clear all card types if I get into a jam. My deck allows for the long game but in the long game you can face some pretty powerful creatures. 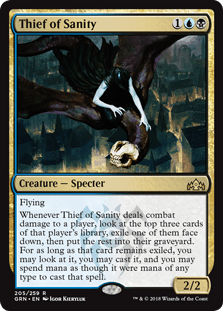 Thief of Sanity lets you pick one of three of your opponents cards and use it against them. It’s ridiculously powerful. More importantly, super fun to use. 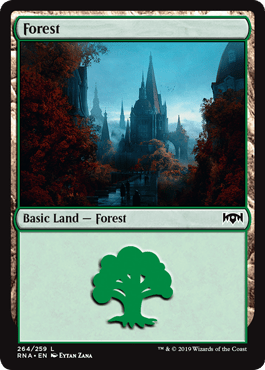 As mentioned before not many 4 color magic decks are built around two specific color cards but this gives me options. Many of them. So how I get around not carrying the specific land cards and having access in regular play – let’s start there. For the record, I carry 11 Swamp, 11 Forest, 3 Foul Orchard, 1 Woodland Cemetary, 2 Gateway Plaza, 1 Guildmages’ Forum, 1 Memorial to Folly, 1 Chromatic Lantern, 2 Gift of Paradise. 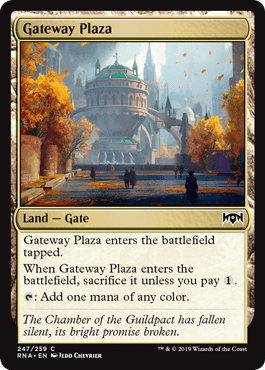 The Gate cards, Lantern and Gift of Paradise give me access to all colors. Enough so that I am starting to toy with adding other color cards to my deck, but things are working well right now. 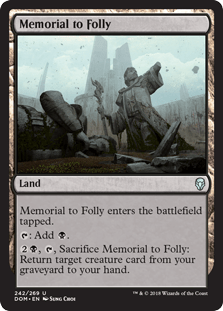 Memorial to Folly is a Graveyard card that is land based (so it cannot be countered). I rarely have to use it but it’s there just in case. 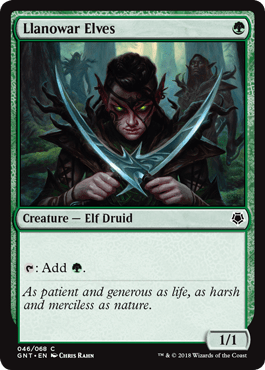 My creature cards have a nice mix of low cost cards (to counter quick damaging aggro decks) and cards that interact well with each other. The Graveyard part of my deck makes things fun. 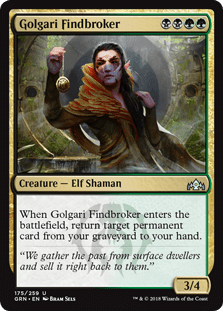 They kill my Ravenous Chupacabra (which is a great removal card for me ) and then I bring it back with the Golgari Findbroker. 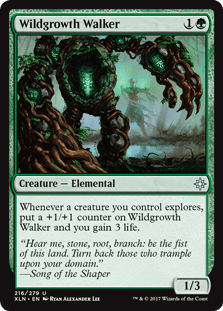 The Wildgrowth Walker is the key card and I carry 4, as every Explore gives me back health. 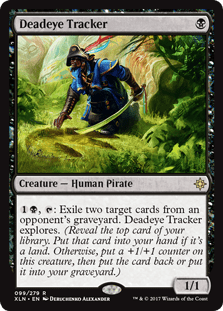 This is also why I love the Deadeye Tracker as it doubles as a graveyard removal tool (meaning opponents don’t ahve the option to bring their cards back from the discard pile like I do. 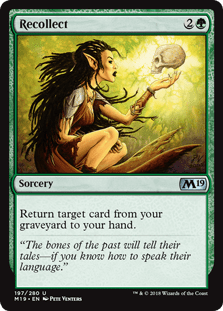 Understanding how explore works, and how returning things from my discard (Graveyard) pile is a big part of how my deck works – it all comes together with the spell cards I carry. These all play nice together with my creature and land cards. This is where things get really fun. 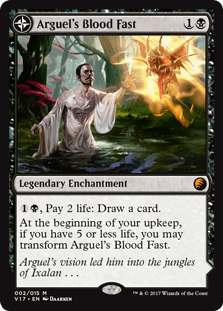 Arguel’s Blood fast and Journey to Eternity are two cards that you can transform (when certain conditions are met) and before that transformation are still very powerful cards. Arguel’s Blood Fast let’s me sacrifice life to draw cards. 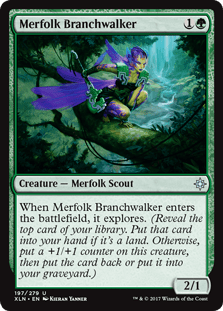 This balances well when I have WildGrowth Walkers on the board. Journey to Eternity protects a card as enemies don’t want to trigger it. 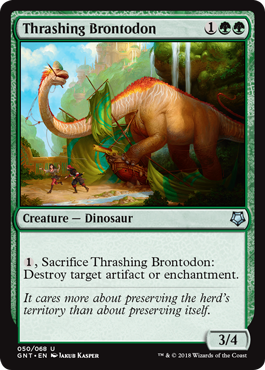 Sometimes I use my own removal cards to destroy my own creature (because I get it right back). Those two cards, when both are transformed, are an incredible fun combination. 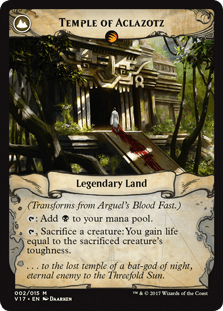 Temple of Aclazotz (Arguel’s Blood Fast transformed) allows me to sacrifice one of my own creatures to gain health back. 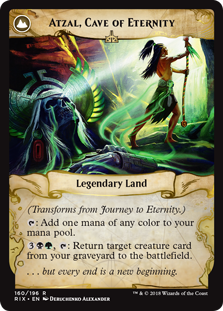 Atzal, Cave of Eternity (Journey to Eternity transformed) lets me bring that card right back TO THE BOARD (not just my hand) – which triggers their card event. 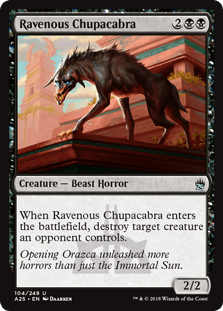 To put that in perspective – lets use my Ravenous Chupacabra. 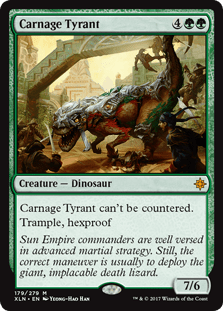 When it enters the battlefield it can remove an opponents creature card for a pretty fair cost. 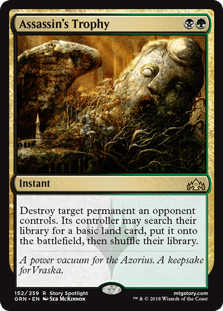 I can then sacrifice it using Temple, and then bring it back to the battlefield with Atzal, triggering it’s removal effect again. Twice in the same turn. Other cards are fun too. 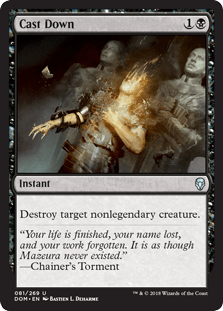 Find // Finality is a good mass clear for low level cards, OR I can bring creatures back from the graveyard. 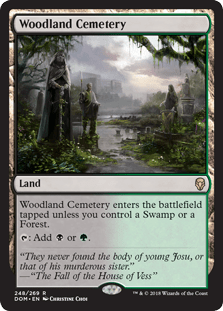 Recollect allows me to bring back ANY card from my graveyard, which is amazing. 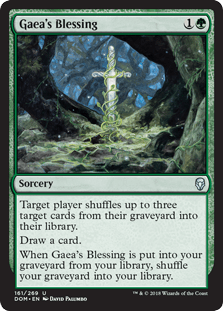 Gaea’s Blessing is a simple card draw but also protects me from a Blue deck that attempts to discard your whole hand as a win condition. The final two cards are things that are triggered based on playing cards. 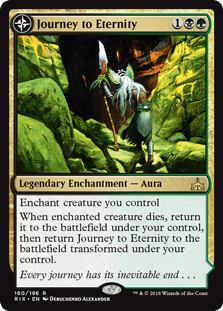 Guardian Project is a card draw state (which I looked for specifically since I was often at the whim of my next draw) and Path of Discovery triggers explore on every creature card play (including when they come back from the graveyard.) 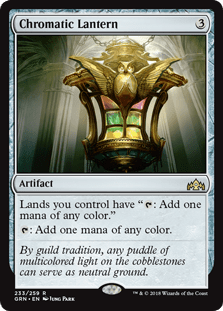 This creates amazing loops of card draws, pulls, explores, and heals. 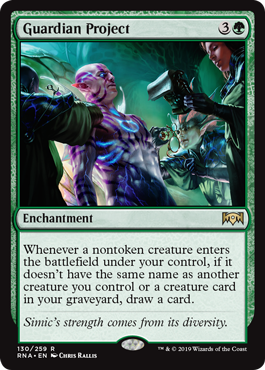 The last piece of the puzzle is my suite of Removal cards to keep the battlefield clean of my enemies cards – creatures and enchants. Duress is a very cheap card that removes a spell from your hand (my choice). 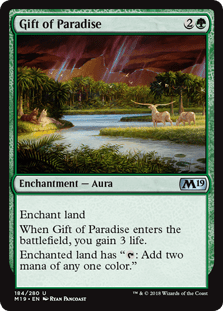 Cast down and Vicious offering are reasonable creature removal cards, Assassin’s Trophy kills EVERYTHING (but they get a free land for it) and Golden Demise kills low cost aggro decks. Never Happened has been a life saver for me (removes ANY card from their hand) and of course, when things really hit the fan, we have Settle the Wreckage as an emergency card. 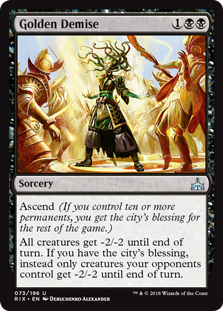 Planeswalkers are powerful cards with fun and interesting play dynamics. I currently use Liliana, The Necromancer – who isn’t super powerful but plays really well into my deck. 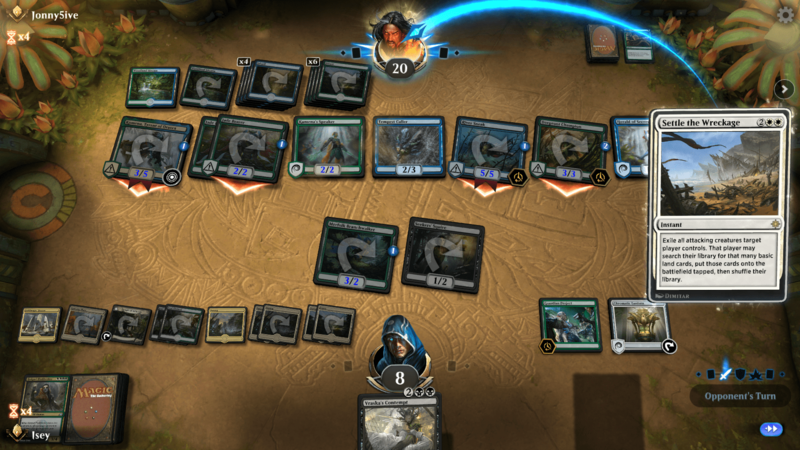 Liliana has a direct attack, another Graveyard retrieve, and the best part about her -7 loyalty move is that I can pull a creature from my opponents graveyard as well. She is the least important card in my deck and I toy with the idea of not using her anymore. 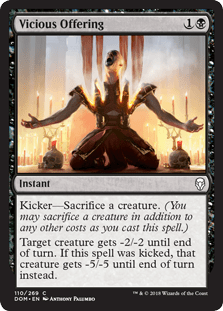 The good part about Planeswalkers is that opponents feel like they must get rid of them fast, so it works as a quasi removal tool / focus changer as well. That’s my deck! Let me know if you have any questions! Definitely looks like Mish mash of ideas, but after you explained everything it makes sense and I like it! Actually up to Plat Tier 4 now and climbing as of this morning. I’ll do a video of gameplay, it’s a TON of fun to play and few points of frustration!